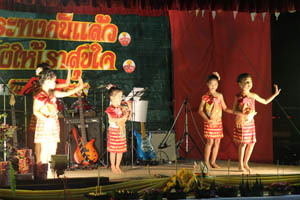 Nong Khai SOS Children’s Village is a couple of kilometers in the south from Nong Khai. Apparently people were waiting for us: as soon as we arrived, the children from the kindergarten (from 3 to 6) welcome us with some gifts made with flowers. Mr. Bovorn, the Village secretary in charge of our visit and Ms. Avitar, English teacher at the Kindergarten will take care about us during all our stay. We did not expect a so nice welcome, and we are happy to see that the educational staffs find an interest in our project. We present to the children our project and do with them the quiz about the countries we cycle through. 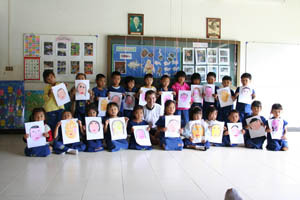 We set an appointment for the next day to perform the workshop dedicated to the self-portraits with the 3 classes of the kindergarten. Then Mr. Bovorn and Ms. Avitar show us the facilities. A common point with all the SOS Children’s Villages that we already have seen, is the attention paid to the garden. They are all very nice! A stage on the football pitch catch our attention and we are told that tonight, a party is organized in the Village, as in almost all the country, with a ceremony during which everybody put into the water a crown made from banana tree and flowers, on which candles and incense sticks are burning. We are gently invited to the party and we accept with a great pleasure! When we come back a couple of hours later, all the children and the SOS Mother have a dinner on the grass in front of the stage. Noon, a teenager of the Village stays with us and explain to us all the sketches that we saw on stage. 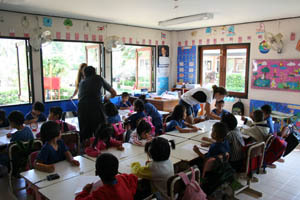 The day after, here we are again in Nong Khai SOS Children’s Village to run the workshops. Around 70 children from 3 to 6 years old are waiting for us. 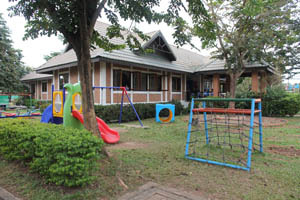 Some of the children are in the care of the SOS Children’s Village, some others come from the neighbourhood. 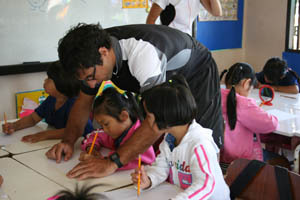 It is the first time that we run the workshops with so many and so young children. We are a little bit impressed at our arrival… Finally we deal with each class separately, which makes the thing easier. Ms. Avitar and the teachers help us all along the morning. As the children are pretty young, we help them quickly to draw the contour lines of their faces and they fulfil it with eyes, nose, mouth, ears and hair. Then the children colour the drawing with clay. 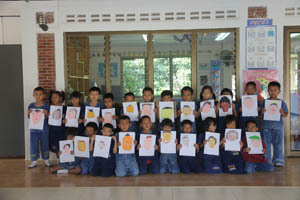 3 hours later, all the portraits are done, and everybody have lunch in the kindergarten facility. Time has come to us to leave the children and the staff and to hit the road again. We were very grateful to the all of them for these moments spent together. SOS Children’s Village is situated in the Nongkhai City of Nongkhai province bordering Laos in the northeastern part of Thailand. 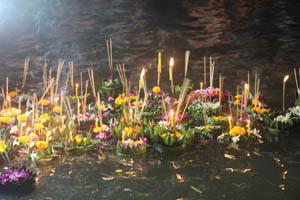 The Village is located on the bank of Khong River. It is 650 kilometers away from the Thai Capital Bangkok. 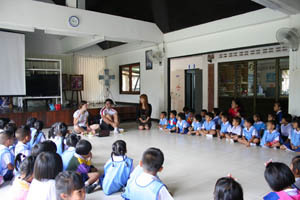 In year 1991 the SOS Foundation of Thailand has expanded project to the northeast of Thailand. The construction of the SOS Children’s Village had begun in 1992 and by January 1993 it opened its doors for the children. 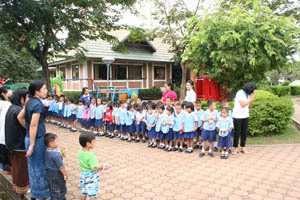 This is the third Children’s Village in Thailand. 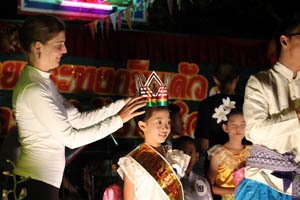 The village was established on over 8 rais (nearly 4 acre) of land, as a tribute to Her Majesty the Queen of Thailand on Her 60th Birthday Anniversary. It is a great honor to the SOS Foundation of Thailand that Her Majesty graciously gave it the name of “Charlermnarin” SOS Children’s Village. The Village was officially declared open in a ceremony held on February 18, 1994 with Prince Jirayu Noppawong, Private Councillor to the Queen Sirikit and Mr. Helmut Kutin in attendance. 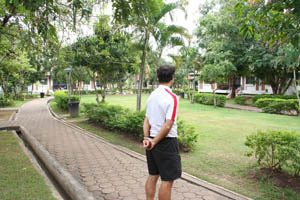 The Village consists of 11 Family Houses, a Kindergarten, a Youth House, a Youth Hostel for boys and a library. Official opening: February 18, 1994 by Prince Jirayu Noppawong, Private Councillor to the Queen Sirikit and Mr. Helmut Kutin. 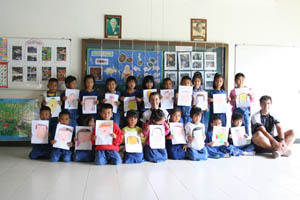 Kindergarten has been preparing the children before they attend the primary schools outside the Village since 1993. It has been in the location of the village and provides three classrooms for 85 children, both SOS children and outside poor children in its vicinity. Moreover the Kindergarten Nongkhai having first pilot project to support Strengthen Family Program (S12), offered the free school fee for ten children from poor families who could not afford education or meal. The poor children were found were found village senior co-wokers by survey in the village’s neightborhood. The free school fee covered with lunch and two snack meals every day as well as all of education aids for the children. This project has been ongoing conducted successfully throughout the next year and planned to help additional children from poor families. 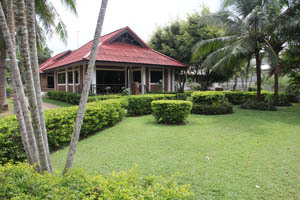 Three houses were purchased for the Youth Facility Udonthani in 1992. 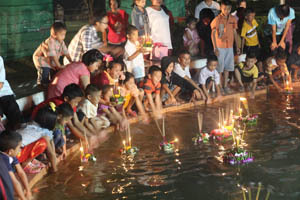 It was buit on one and half acres of Landat Udonthani and located 55 kilometers away from the Village. Since 1992 the Youth Facility Udonthani has been ready to accommodate two boarding houses for SOS teenager boys from Chalermnarin SOS Children’s Village Nongkhai when they are ready to live separately from their SOS family. At the present by President Helmut Kutin and the SOS Thailand Boards Committee’s final decision to moveYouth Facility in Udonthani, it rens the new youth facility close to Youth hostel in Nongkhai since March 2006. Now it provides for 13 youths there. The Library came into being in 1997 by the joint great efforts and donation of miss Bhasna Suwansathien, Board of Directors member of SOS Foundation of Thailand as well as Rotary Club of Thailand. It is the quite large library and having a lot of fiction and non-fiction books to support our children’s knowledge and interested at SOS Children’s Village Nongkhai. It is the great honor to SOS Children’s Villages Thailand that Her Majesty the Queen of Thailand graciously gave the name of village as ‘” Chalermnarin”. It name has been very beautif Thai word. Especially its significant word’s meaning that represents “in honor of the Great Lady”. Moreover the meaning of word, Her Majesty the Queen’s royal grace has been always in every single SOS children’s heart at SOS Children’s Village “Charmnarin”. 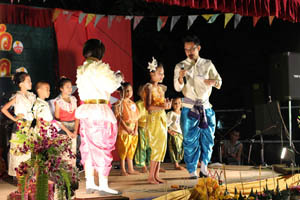 Mr.Wichan Kampinit – Village Director.